I started my farm with kitchen scraps with the intention of moving over to dog poop. Since I started adding more poop I have noticed some maggots. Should I be concerned or take any action? 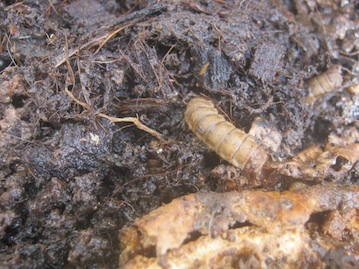 most maggots are not really a problem for the worms. It depends what kind of maggots you got in your worm bin. The common housefly maggots are irritating but are no threat to the worms. I hardly ever get them in my worm bins. If you want to get rid of those or want to prevent them from getting into your worm bin in the first place there are 2 ways to go about it. 1. Either collect the dog poop as fresh as possible before flies have the time to lay their eggs into it or let the dog poop dry out in the sun which will kill the fly eggs and or any hatched maggots. Then add them to your worm bin. 2. If you have housefly maggots in your worm bin already. Take some rubber gloves and carefully remove as much maggot infected dog poo and bedding as you can. Make sure not to remove worms as well. Place all the maggot infected poo into a small bucket and pore boiling water over it. This will kill the maggots. Once the water and poo have cooled down add them back into your worm bin. Another cup of tea are the maggots of Black soldier flies. Worms don't like to live in the same environment as BSF maggots and an infestation of those maggots in your worm farm will usually lead to a complete loss of all the worms inside the bin. Those maggots are easily identifiable as you can see in the attached picture. When you find them in your worm bin remove them asap and either pore boiling water over them, let them die in the sun or feed them to your pet fish or chickens. There are more articles on my side that deal with maggot infestations of worm bins. Feel free to look at them for more information. If you have any further questions please let me know.